I’m here having a great time in Chicago, at Agile 2009. 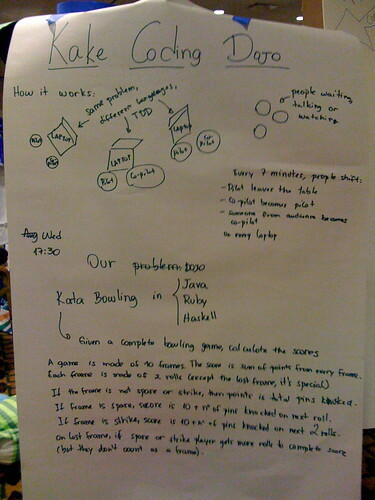 I will write more about the sessions in later posts, but I wanted to talk about the Coding Dojo we ran at the Open Jam. 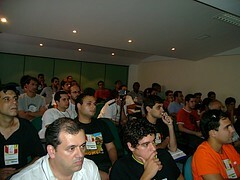 Organised by my friends from the Dojo@SP (thanks Hugo, Mari, and Thiago! ), we tried a projector-less format that went really well. I wrote about the Kake Format a while ago, although the name changed. 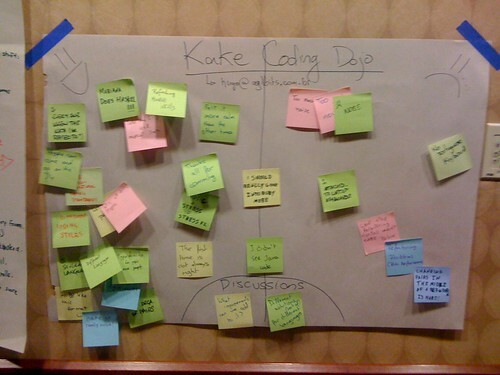 If you want to try out a dynamic format, where people have more chance to participate and train different skills, and you don’t have a projector available, I urge you to try out the Kake Format on your Dojo and share your experiences! 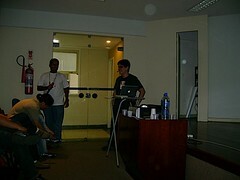 I hope this is helpful and, for more information about the São Paulo Coding Dojo, follow our blog, join our discussion list (for the Portuguese speakers), read our paper or some of our session reports in the Coding Dojo wiki (in English). Enjoy! 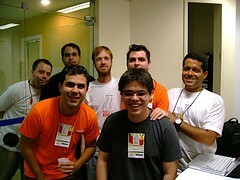 For those of you who didn’t know, after going to XP 2007 last year and speaking with Emmanuel Gaillot, I decided to start a Coding Dojo in São Paulo, Brazil. We’ve been running weekly sessions since last July and after I moved to London, Mariana, Hugo, Fabricio, and others are making sure that the Dojo continues. It has been very fun and educational to organize and run the Dojo, so we decided to share our experiences with the community. We are proposing a 30 minutes Experience Report to be presented at Agile 2008. I wanted to submit this proposal earlier to allow more time for feedback and reviews, but the bureaucracy of moving to another country and the excitement of working with very talented people has kept me busy. But the deadline for submitting session proposals to Agile 2008 is tomorrow, and I didn’t want to lose the opportunity of attending and sharing our experiences. We would appreciate any feedback to improve our session. The link to the proposal is here. Thanks! Depois da conversão, a qualidade do vídeo acabou sendo prejudicada. 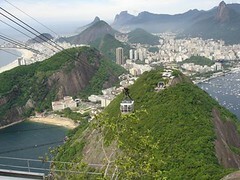 No tamanho original dá pra assistir, mas as letras ficam pequenas (principalmente quando mudo pro terminal). Os atalhos de teclado (gravados com o KeyCastr) também ficam ruim de ver. O código final dessa e de todas as nossas reuniões pode ser obtido no nosso Google Groups. Gostaria de agradecer a Mariana Bravo por ter criado nosso logotipo, o Paulo Sacramento, por ceder a música Batida Urbana sob a licença Creative Commons – Atribuição-Uso Não-Comercial 2.5 Brasil (utilizada na introdução e no final do vídeo) e aos participantes da reunião pelo feedback e ajuda na resolução do problema: Breno Franco, Daniel Cordeiro, RBP e Thiago Colucci. Espero que esse vídeo ajude a mostrar como o Dojo funciona. O feedback de vocês é muito importante. Caso o retorno seja positivo, podemos produzir outros vídeos semelhantes. Se você se interessou pelo Dojo@SP, junte-se a nós!